15 Etsy Store Owners. Who got more comments will win a Kiwi Emery Pincushion from me. Here is the Fourth Candidate Sandi AKA I Knit Quilt Sew. Thanks for giving me an outlet for my passion. Every time I would give a quilt/blanket/booties/bear, etc., the recipient would comment, "Oh, you should sell these!" After nearly forty years of hearing this, I'm finally taking that plunge! I truly love what I do... whether it's knitting that perfect pair of booties or hand-quilting my latest creation, it's a labor of love. Though I'm creating a commercial environment for my work, I don't want to lose that passion. For this reason, you won't find hundreds of items in my store. Each and every item will be made with care and great attention to the details. My grandmother taught me to knit and sew before color TV was invented! Most of my knitting comes from her patterns which she claimed were her mothers - which would date them in the late 1800s! This is what gives my knitting its old-fashioned, classic style. I am a self-taught quilter, though. I learned that from a book years ago. But primarily, I'm an artist. My medium is fabric and yarn! I have my own room in our home which is full of my “stuff!” It has a comfortable chair, my quilt frame which converts to a work table, a nifty sewing cabinet, a large closet and wonderful natural light (the room faces east). My quilt frame is right under that window! 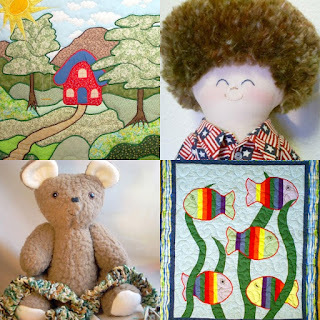 Sometimes, I don’t need much of something to add just the right accent to a quilt or a doll, so I save virtually everything! I had a three-shelf rolling rack which over time was full to literally over-flowing with every fabric I owned in no particular order. Of course, what I was looking for at any given moment was ALWAYS on the very bottom. To get organized, I purchased inexpensive cardboard storage units, each with four drawers, from Wal-Mart. If memory serves, they were about $8 each. (They are still available in the ‘organize your closet’ section.) Because they are cardboard, I was able to write on the face of each drawer so that I know what’s inside. The four units fit perfectly in the end of the closet in my room. When I need something, I just pull out the whole drawer and set it on the table! Of course, what I want is STILL on the bottom! Once the mental image of the finished quilt exists, I draw a rough pencil sketch of what the quilt will look like and how it will be formatted. My drawings are really horrible, BUT they do serve to give me a rough layout of what I am about to do. What feature is going to be in the foreground/background? What contours are involved? Etc. If I am going to attempt to quilt something I’ve never done before, I work harder on the drawing. I have learned that if I can draw it, I can quilt it! This drawing became this quilt. Here is the drawing for the quilt I am working on now. Then it’s time to decide on colors/textures and make sure I have everything I need including the back of the quilt. I buy batting by the bolt, but I purchase some material for each project as needed. All of the items for sale in my shop exist. The pictures on each listing are of the exact/actual item the customer receives. I wrap each item in clear cellophane and tie it closed with a complimentary colored piece of ribbon. This protects them from airborne dust, etc., as I live in a rural area. All of my items (with the exception of dolls and bears) are washed when I finish them for this reason. If they’ve been completed a while (a month or more) before they are sold, I will wash them again just before they ship. Each item is wrapped in clear cellophane, tied with a piece of ribbon. All of my items are tagged. Many of my items also have a sewn-in permanent tag as required. For a single small item, I ship first class mail in a padded envelope with Delivery Confirmation. Multiple items always go in a box. I will ship Priority Mail at the customer’s request, and sometimes just because I want to give a customer purchasing more than one thing an ‘upgrade’ as a way of thanking them. My absolute favorite is Jo-Ann, even though it’s a 100 mile drive for me to get to a store! When I go, I always have a long list! Robert’s Crafts is great for high-end yarn. There is a store where I live called, “Granny’s Quilts,” which has high-end quilting fabrics and hand-quilting threads in any color I can imagine. I have purchased fabric from Jo-Ann online, but it is always more of something I already own. I sometimes purchase fabric from Wal-Mart’s yardage aisle, but not too often. Thank you so much for featuring me in your beautiful blog! 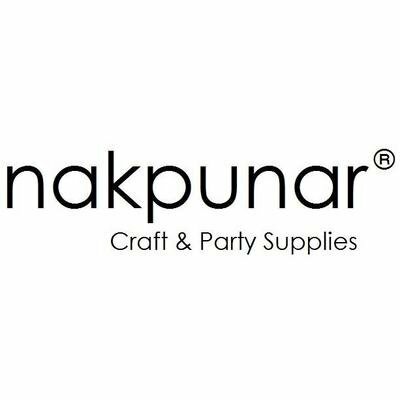 I have been amazed at what I have seen on this online shop and the quality of the product! The authenticity is unmatched by anyone else. Beautiful work! Your things are so cool and original. I hope you are still selling when one of my children gives me some grandchildren. We love everything that you have made for us. I just wish I had half of your talent. Love you Mom!! Wow, what a talent! 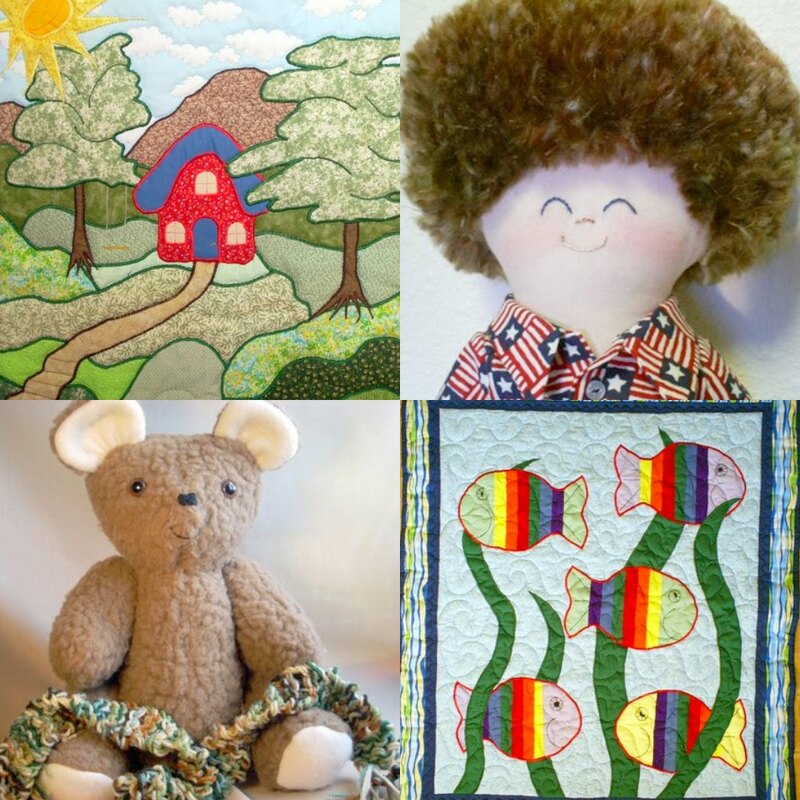 The dolls are darling, and the quilts are beautiful. Loved your store! Love your dolls and quilts!!! This work is so beautiful and creative. Thank you for sharing your talent! your stuff is amazing. I am glad to know that the art of quilting isn't dead. quilts are always nicer when they are made with care than just bought. Thank you for your work.